I'm visiting friends who recently started to try their hand at beekeeping. They were gracious enough to let me photograph the hives while they had them open for inspection. The surface of a new comb. These cells are being constructed on a black plastic frame that has its surface formed into a hexagonal grid of standard-footprint cells with sides only a mm or so high. The bees then extend the sides of the cells outward from the base, generally preserving exactly the same layout as the plastic grid. The use of this type of template was new to me. I think I was lucky enough to catch one drone in this image, in the upper right corner. All shots with Canon T1i camera and Canon 100mm F/2.8L IS USM macro lens, handheld. First three with onboard flash, no diffusion; last image natural light. Interesting images, especially the last. I recently watched a documentary which included, among many other matters, hexagons. Bee hives were obvious inclusions in the commentary. I had wondered if bee keepers provided hive 'templates'. The bees then extend the sides of the cells outward from the base, generally preserving exactly the same layout as the plastic grid. 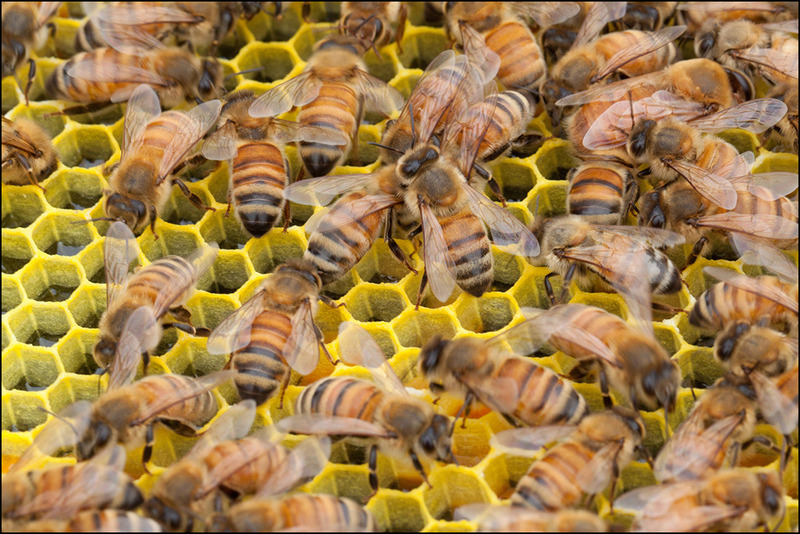 Bees will normally build the hexagons to dimensions appropriate to their species. Building such grids is hard work for bees, hexagons happen to be the most economical method, but they are also the most efficient shape. Are these plastic grids species specific or is it left up to the bees to add wax as determined by intuitive instinct? 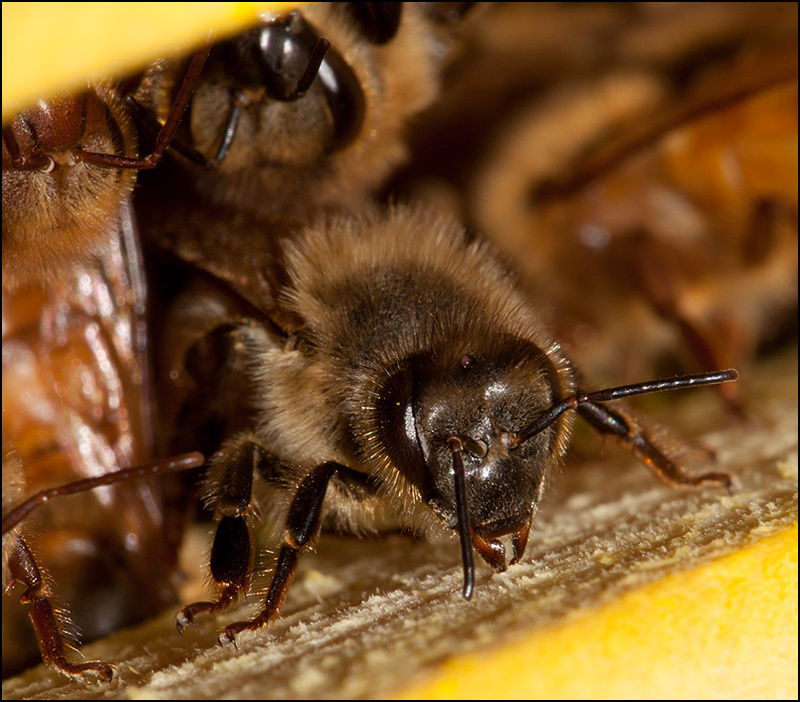 As far as I know, all commercial honeybees in the US are a single species with not much variation. There are many believers in small cell who claim that smaller cells lead to superior mite resistance. These claims are scientifically unsubstantiated, but as with any new product that promises to safely and naturally combat mites, we're committed to providing you the opportunity to try it. We advise only experienced beekeepers try this. I did see drone cells in the middle of these normal arrays, but I didn't get any pictures of them. They stick up far above the surface of the regular cells. I don't know if they have a larger footprint. 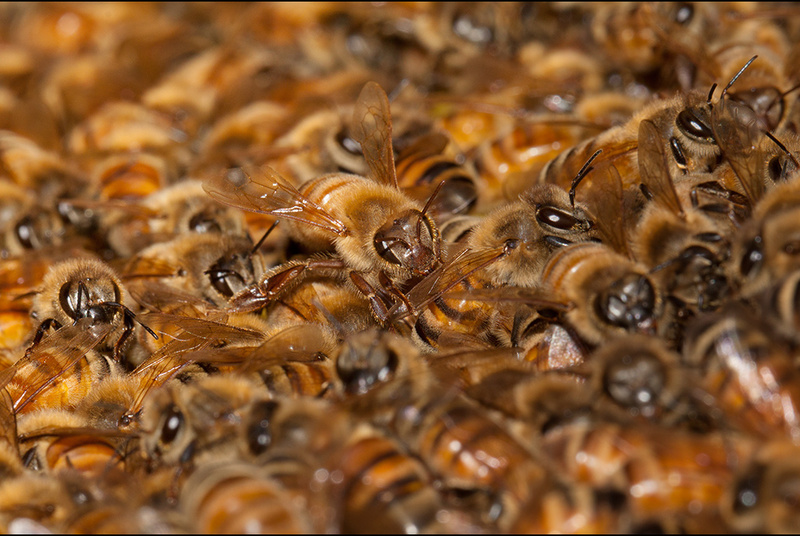 The bees will naturally build a dense hexagonal array of cells. It's just not quite as regular without the manufactured foundation. That is a partial answer to another question buzzing 'round my brain. If bees become accustomed to the artificial 'grids' or 'templates' do they eventually lose the ability to create their own hexagonal array of cells or to pass that intuition onto subsequent generations? I also often wonder (but have not looked into the matter) if Ivan Pavlov ever reversed his classic 'dog' experiment....just a passing curiosity, no need to respond. 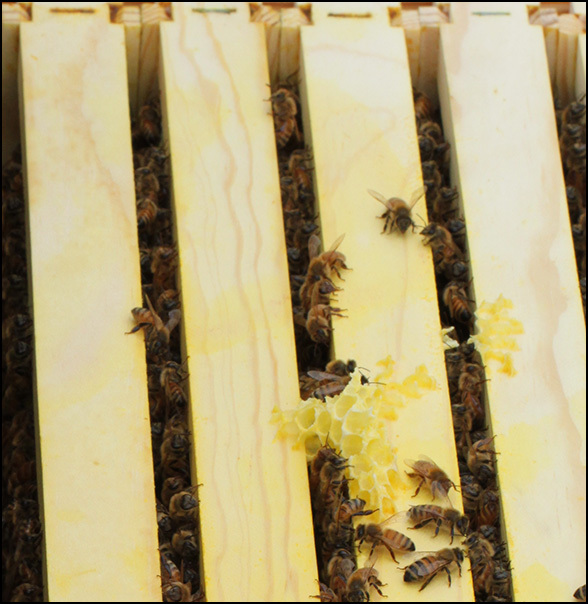 Although plastic foundation (moulded intercell sheets) is available, the norm is processed, sterile, recycled wax from cappings cut off when extracting honey and other odd bits of unwanted comb. It comes in two basic cell sizes, for workers and for drones, and in various sheet sizes to fit the various frame sizes. One of the most pleasant aromas is that of fresh foundation. Drone cells are larger both in length and diameter. Interestingly bees build circular cells it's just that when they are joined to neighbouring cells they become hexagons. Bee-keepers try to make life easier for bees and provide them with wax or plastic foundation with the hexagon shape already embedded. 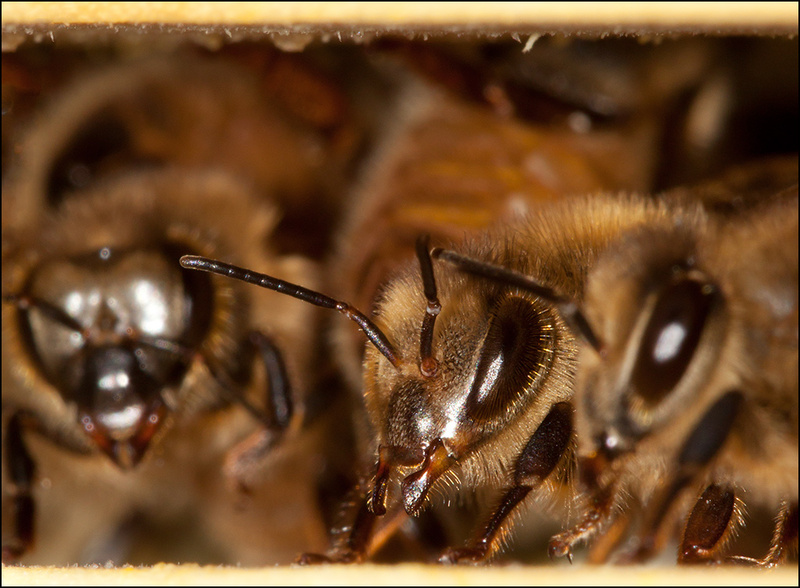 All honey bees belong to the Apis melifera species and there are about 30 subspecies. In the USA where the honeybee is not a native the strains are normally a mix of different European subspecies. The caps on sealed drone cells are raised (domed) much more outwards from the cell wall than those of workers. Interestingly bees build circular cells it's just that when they are joined to neighbouring cells they become hexagons. It depends how you define a "cell". Internally, they are always of circular cross-section. I wanted to include this video link because it is relevant to the topic. It's a short partial segment taken from the BBC series 'The Code'. I've been reluctant to add the link to this thread mainly because the word 'evolution' is mentioned three times during the short segment; but as a whole, the series was quite reserved with the use of such a.... cosy commentary and thankfully, mainly focused on mathematics....a much clearer indicator, in my view, to arriving at an accurate understanding of the physical environment. If you have an opportunity to watch the full three part series, I can recommend it. Different people twitch over different things. "This almost looks man-made, manufactured. I mean it doesn't look like something from the natural world. The precision, the fine straight lines that they've created is extraordinary." "Right, right, it's an engineering wonder, for sure." The problem from my standpoint is that the aspects they're talking about are man-made and manufactured. Those long straight lines came from the human-engineered foundation, which was close enough to what the bees would do naturally that they played along in extending the pattern outward to form the cells. I put a box with no wax foundations on top of each of my hives a few weeks ago, to see if they would build some straight comb and fill it with honey. When you give bees space with no foundation, you have to keep an eye on them to discourage them from just building wild wavy honeycomb every which way. One frame had a nice straight comb started, but on another frame there was this beautiful 'art comb' begun. The last photo shows how it was oriented when hanging from the frame's top bar. Keep in mind that all the curves on this piece of comb are exactly how it was built by the bees- there was no sagging or bending to create these undulating folds. It's like a delicate coral. I had to remove it because if it got larger I wouldn't be able to remove frames later on at all. In the wild, bees naturally construct comb shaped like beautiful hanging leaves. It was a shame to have to cut this comb out, but it's certainly a lovely delicate and mysterious thing to have in the living room to show people. It smells wonderful too, pure beewax. Hopefully the bees will try drawing some straighter comb next time. Thanks for the info. It was interesting to read. True, the example used in the video clip may appear to be a bit too 'accommodating' for the point being presented; but look closely at the honeycomb 1:54. In commercial production man made templates are used; the less work the bees have to do the quicker they can begin to produce the honey; but what is not displayed in this short segment is a shot of the beekeeper scooping out a handful of honey and honeycomb. That is a beautiful example of clearly hexagonal chambers. It's the shapes and patterns which interest me. In commercial production man made templates are used; the less work the bees have to do the quicker they can begin to produce the honey. That is not the prime consideration. In the movable frame hive the provision of flat sheets of foundation, impressed on both sides with template bottoms of worker cells does two things. 1) It helps to keep the comb flat when capped, thus making individual frames easy to lift without jamming against adjacent ones or squashing worker bes, or, ever worse, the queen. 2) In the centre of the colony it maximises the production of workers, rather than drones, thus building up the workforce as rapidly as a possible. 3) In boxes above the brood nest, from which the queen is excluded and cannot lay drone egggs, some beekeepers prefer to use drone foundation, the honey to wax ratio being better. (I have not done the calculations).